The weekend is going nicely thus far. I’ve actually had a little time to read! Yay! The strawberries in the garden are also getting ripe so I had to share. Oh my God, that looks good. My parents gave me a fondue pot for Christmas, and I haven’t used it for chocolate yet. Not that you have to fix chocolate covered strawberries that way, but doesn’t it sound good? Double the pleasure with just a little chocolate! Now why aren’t you my neighbor? Your strawberries look delicious! I love the combination with chocolate. wow, these look so very yummy. Wow, your strawberries look perfect! What a good gardener you are. And they look even yummier with chocolate. Yum? I’ll say! Around here this year, even without the chocolate, the strawberries have been out of this world. I went strawberry picking on Friday and then made about 9 pints of freezer jam! Yum indeed! 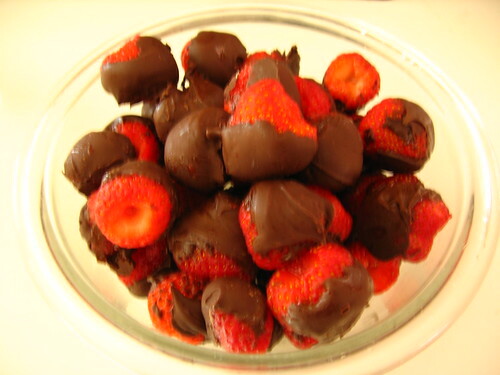 You can also add a little balsamic vinegar instead of chocolate for a less sweet treat. I have to just say that those strawberries really were delicious! 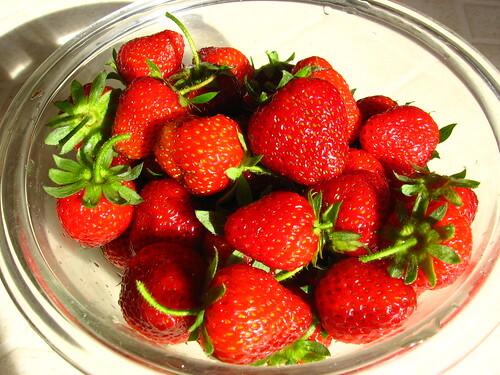 Emily, it is a banner year for strawberries! Yum! Our plants only have flowers this first year, perhaps strawberries next summer. Mmmm. As much as I love chocolate, strawberries are one those things perfect all on their own. I don’t know about vinegar, but I had them once served with fresh ground pepper — surprisingly good. Jodie, if you have flowers you might get a couple of strawberries. I’ll keep my fingers crossed for you! Rebecca, oh yes, best dessert ever. Isabella, pepper on strawberries tastes good? I will have to believe you because I can’t imagine the flavor combination and I am reluctant to try it. You have strawberries already?! Impressive. Mine are still flowering!